This pumpkin is worked as a (sort of) rectangle, which is then stitched together to make a pumpkin. This version of the pattern ends up being about 2.5 inches wide, and 2 inches tall (including stem) using worsted weight yarn and size E hook. ALL stitches are worked in the BACKLOOP!! Leaving a long tail, Ch 13. Row 1: Sc in 2nd ch from hk, sc in next 2 sts, hdc in next st, dc in next 4 sts, hdc in next st, sc in last 3 sts. Ch 1, turn. Row 2: Sc in 2nd ch from hk, hdc in next st, dc in next 8 sts, hdc in next st, sc in last st. Ch 1, turn. Repeat rows 1 and 2 eight times, (you should have completed rows 1 and 2 nine times) and fasten off. When you have finished, take the starting chain's tail to stitch the ends together, the starting chain to your last worked row. Then stitch the side closest to that thread closed. The trick is to only stitch to the "bump" part of the ridges. I'll post a picture up of what I mean when I make my next pumpkin. Circle the side a few times, so that when you pull it tightly, it is closed. You will pull the thread through to the top to tie a knot later. Now is the time to stuff the pumpkin and put in any bead decorations. Then take the thread from fastening off the last row, and stitch the top of the pumpkin in the same manner described for the bottom. 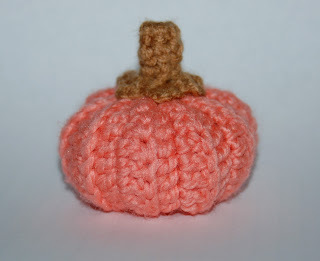 Once you are finished, pull one of the remaining threads through the pumpkin to the other end to tie a knot. Don't worry, the stem will cover this knot. ch 4 and sl st to form ring. Row 1: Sc 5 in loop. sl st with first sc. Ch 1. Row 5: (sc, ch 2, sc) in each sc, the last one ending with a sl st. Fasten off. Now stitch the stem to the pumpkin to finish your masterpiece! Lovely! I have a skein of orange/brown/caramel umber bulky yarn and some brown crochet cotton. Think I'll see what comes of it using this pattern. Can I post a picture? The pumpkin turned out really cute. You can post a link here to your photo, I don't think there is a way to post photos in the comments. You could also upload it to Ravelry. :) I'm glad it turned out great for you!